Spring in the Pacific Northwest inevitably brings thoughts of razor clams, or at least it does if you have ever dug them or eaten them and live within striking distance of Long Beach Peninsula, Grayland, Ocean Shores, Copalis, or Kalaloch. 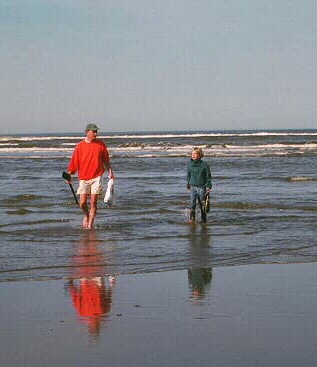 Fifteen years ago, I rented a house with some of my cousins and went clamming on Long Beach. It was such a successful event (135 clams in on the first day!) that I put up a little web page about it, which miraculously still exists out there on the Internet. But I’ll relive the experience here, too. After all, it’s Throwback Thursday. 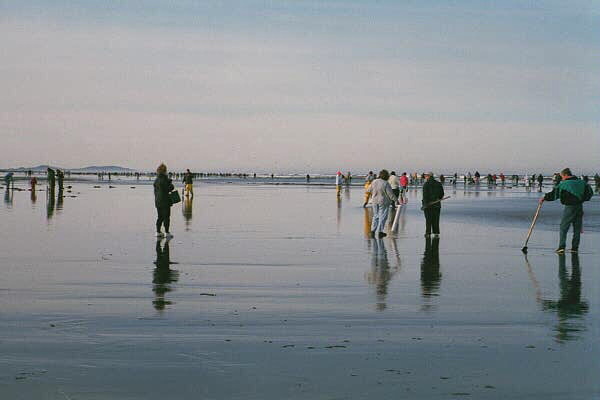 My timing is pretty good, too, because the Long Beach Razor Clam Festival is coming up this weekend, April 18-19! If razors are unfamiliar to you, you are laughing at the notion that we were so happy about 135 clams, but note that the daily limit is the first 15 clams you dig. That’s because once its fragile shell is broken, a razor clam won’t survive. They’re called razor clams for a reason, by the way — those broken shells are sharp! Bear in mind that only two or three nice-sized clams make a fine meal. Someone once said that going after razor clams fulfills the human urge for hunting, fishing, and farming all at the same time. You have to be up early to catch a spring tide near its lowest point. It’s cold and there is likely no time for coffee. If you are doing it right, you will get wet and you will probably end up eating sand. You certainly won’t be alone. 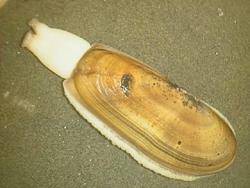 Oh, and those clams are several inches under the surface of the beach and they are not just sitting there. They are trying to get away from you. I won’t go into methods, but you can learn more here. Old hands often dig in the surf. Kids might sit down and dig high on the beach. Some folks like to use specialized shovels, some prefer clam “guns.” Just remember, everybody over the age of 15 needs a license. If you are successful, you’ll have your work cut out for you cleaning your catch. I remember that we set up an assembly line to clean our 100 plus clams. Boiling water goes on to loosen the shells, followed immediately by cold water so they don’t start to cook. I like to use kitchen scissors but a sharp knife works, too. These WDFW instructions describe what to do. The best way to eat razors? I recommend cleaning a few as soon as you get back from the beach. Their delicate texture and rich flavor is hard to describe but, once experienced, never forgotten. Shopping list: eggs, flour, Saltines, oil, butter, lemon, pepper. Serve as quick as you can, with eggs and toast along side if you like. That’s the way I learned to do it when I worked for the old Department of Fisheries about a gazillion years ago, reinforced over the years by my cousin Jill, who is just about the best cook I know. As for all those “extra” clams, the necks are are great for chowder. It’s hard to beat sautéing the rest (body and foot), though. You can freeze razor clams, but fresh is best. Sure, you can try some fancy recipe, but nothing you make will ever be as good as clams coated in saltines, sautéed when you and the clams are fresh off the beach. Have you been clamming? Plan to go? Got a favorite digging method or recipe? What’s your experience with hunting or gathering your own food? Please share in the comments! Categories: Nostalgia, Pacific Northwest, Travels | Tags: razor clams, Spring, Throwback Thursday, WDFW | Permalink. Great blog. Also try a light roasting on a cookie sheet with a little olive oil and pesto smeared on the clams. Yum! I’m heading to the beach. O dark 30 Sunday Narda and I joined the parade of clammers headed west. At Moclips (Roosevelt Beach) we had our limits of huge razor clams within 1/2 hour. These are the biggest clams ever and there are a lot of them. Thanks Suzanne. I’m glad to hear the clamming — and the clams — were so good. Back in the day, Roosevelt Beach was just about the best place to dig on the beaches north of Grays Harbor. Enjoy your clams!